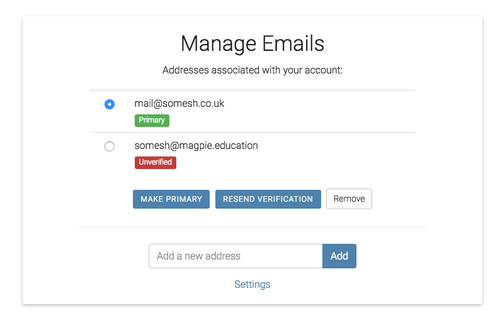 Multiple addresses can be associated with your account and any one of them can be used to login to Magpie Education. Type your new email address in the text box and click add. We'll send you a verification email, which will have a link you need to follow to verify your account. One of your email addresses will always be marked as Primary. We'll use this for important communications and linking to your school account. To change your primary email, select the address using the buttons on the left and click "Make Primary". You'll need to verify each new address, before you can access certain features or signup to paid subscriptions. We will send you an email with a verification link when you signup or add a new email address to your account. To request a new verification email, select the address using the buttons on the left and click "Resend Verification"
Remove an address from your account, by selecting the address and clicking "Remove". You must have at least one address associated with your account.